Orpheus Britannicus has established itself as one of the most dynamic period-instrument and vocal ensembles to have emerged in recent years. Its players and singers are drawn from some of the UK’s leading performers in their field. Founded by Andrew Arthur in 2002 and based in Cambridge, the group has enjoyed great success, building a reputation in particular for its expressive and emotional approach to the rich vocal chamber repertoire of the 17th and 18th centuries. Recent performances have included Handel’s 'Gloria' for Soprano and strings, J.S.Bach’s Cantatas BWV 4, 35, 51, 54, 56, 82, 82a, 169, 170, 202, 203, 209 & 210, Zelenka's Lamentations and numerous solo songs, dialogues and odes by Henry Purcell and John Blow. Recent choral projects include three contrasting programmes of sixteenth- and seventeenth-century English verse anthems, J.S. Bach's Motets, Church music by S.S. Wesley, German Romantic motets and an Anniversary celebration of Benjamin Britten and Francis Poulenc. Ongoing commitments include the performance of J.S. Bach’s complete cantatas for solo voice. 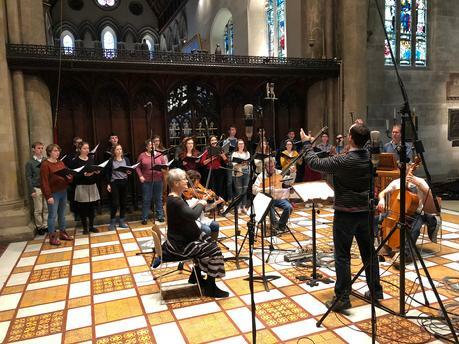 Orpheus Britannicus also regularly assumes orchestral proportions, and has enjoyed some fine collaborations with the London-based Chandos Chamber Choir. Performances in this guise have included J.S. Bach's Johannes Passion, Handel’s Coronation Anthems, Dixit Dominus, Messiah and verse anthems and Welcome Odes by Henry Purcell. Future engagements include J.S. Bach’s Messe in H-moll and 'Lutheran' Missae. In 2008, Orpheus Britannicus took up position as Ensemble in Residence at Trinity Hall, Cambridge, where, in addition to its public concert performances, it offers opportunities to current Trinity Hall students to engage with the musicians in the context of ‘open’ rehearsals, workshops, master-classes, concerts and recordings. The name Orpheus Britannicus is taken from the title of Henry Purcell’s two great volumes of songs, published by Henry Playford in 1698 and 1702 respectively.